A New York Times bestseller: A “charming” memoir of growing up Jewish among New Orleans high society—and finding a place in the bigger world (Winston Groom, The Wall Street Journal). The Wolf family had been in New Orleans for generations. They were Jewish but—as Peter Wolf’s grandmother put it—“not in an obvious way.” In fact, they threw lavish Christmas parties to entertain Peter’s father’s friends in the cotton business and even put up a tree. But despite their success and their philanthropic work, the Wolfs were always excluded from NOLA’s inner circles, elite clubs, and high-status Mardi Gras krewes. It took a detour to New England—where Peter attended Exeter and Yale, and met friends like Calvin Trillin—to put the young man in touch with his cultural roots, and an adventurous adult life beyond the Big Easy to see the corruption, insularity, and racism that lurked beneath the cultural and culinary delights of his home. With a fond heart and a clear, candid view, Wolf offers this reminiscence of his childhood in Metairie, Louisiana, and the unique social hierarchies of New Orleans, with its old Creole families and residents both rich and poor. 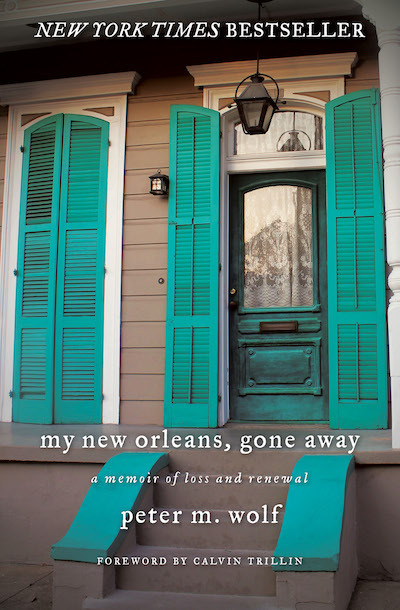 A meditation on place and identity, this is “a loving and beautifully written portrait of New Orleans in the 1950s and 1960s” and a look at a landscape that was shifting and disappearing even before Hurricane Katrina altered it forever (Booklist).